· if the previous efforts did not help, buy a product containing trisodium phosphate or sodium tetraborate. Remember that for the application of active chemicals you need to use containers with special nozzles, brushes on long handles and toilet brushes. Keep children and animals away from the place of cleaning. If you are not a supporter of chemicals, try pouring the toilet overnight with a solution of vinegar, and in the morning rub it with a toilet brush and rinse well several times with water. And the purity of the toilet bowl is guaranteed. Tile, ceramic sink, taps are cleaned by methods already known to us (discussed above). Stainless steel sink can be washed with a solution of vinegar with water in equal proportions. We put the solution on the sponge, wipe the sink and admire its purity and brilliance. A new look to the stainless steel cooking pots will give a slice of lemon. Wipe the pots with it, then rinse with running water. Particular attention should be paid to household appliances. Limescale or scum in many cases becomes the cause of breakage of household appliances that use water: dishwashers, steamers, washing machines, electric kettles, irons – all of them are exposed to hard water. Repair or replacement of this technique causes troubles to housewives. Nowadays a lot of means are produced, with regular use of which this problem can be avoided. Usually they are easy to use and, after reading the instructions carefully, you can easily cope with the contamination. • In coffee makers, electric kettles, bottle sterilizers, the descaling agent is poured into the water tank, after which the device is filled with water and connected to the electrical network. After the completion of the procedure, all appliances need to be turned several times on boiling with clean water to remove the remains of the cleaning agent. • To clean the iron, pour the agent into the water tank, put the iron in a steam discharge mode and place the iron in a horizontal position into a deep container. The appliance must be unplugged. Leave it in this position until the solution completely flows out from the iron, then several times wash it with clean water. • To clean the steamers, the cleaning product is poured into a container and left for 1 hour, after which it is washed several times with cold water. • For descaling of the heating element of the washing machine, place the special agent in the compartment together with the washing powder in accordance with the instructions. If you remove limescale regularly, you will get rid of many problems, and it will not take long. – All works with chemicals should be carried out in rubber gloves. – If the cleaning agent is very aggressive, use a respirator or mask. 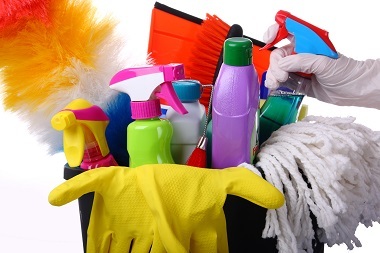 – Do not allow children and animals enter the premises when cleaning with chemicals.